Redfish are one of the best gamefish in the surrounding waters off Anna Maria Island. They can be searched by looking for a bronze or reddish with whit undersize. They have a prominent ringed spot or several spots at the base of the tail. Silhouette is similar to black drum and colors can sometimes be confusing in very large fish, but the redfish has no chin barbels. Reds are caught from less than a pound to an average of 8-12 pounds in Tampa bay and Anna Maria Sound. 30 pounders are not unusual and the potential in Florida is about 60. The world record is 94 pounds,2 ounces. Florida record is 52 pounds 5 ounces. Redfish in the 8 pound and less range ranks among the best tasting for most anglers. The legal limit is one per person and the slot is 18-27 inches. All kinds of casting tackle, including fly are successfully used on Redfish of all sizes. 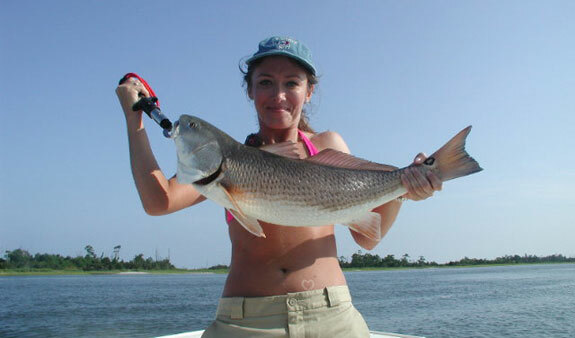 Redfish are ravenous feeders that will take live sardines, shrimp, crabs and cut baits. Shiners and shrimp make the very best baits for shallow coastal fishing; live pinfish, small mullet or similar baits for deeper depths. Most productive artificial baits are weedless spoons and top-water pugs. Large streamers and poppers do the best for fly fishers. When targeting reds the most popular areas are along oyster bars and rocky or grassy shorelines on the shallow flats were they can be sight fished. Reds also forage on the beaches of Anna Maria Island and Longboat Key. Large schools of a hundred or more fish are seen throughout the year. Adults move offshore to spawn and can be encountered throughout the gulf.